Look what the wind blew in! 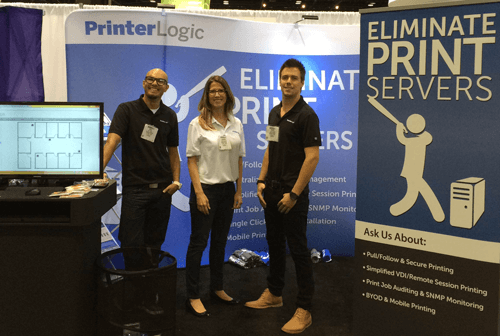 We were at HIMSS 2015 to talk to the show’s more than 38,000 attendees about how we Eliminate Print Servers. Doing so empowers IT to manage their entire print environment from a single pane of glass and enables end users to install printers with one click through our Self-Installation Portal. 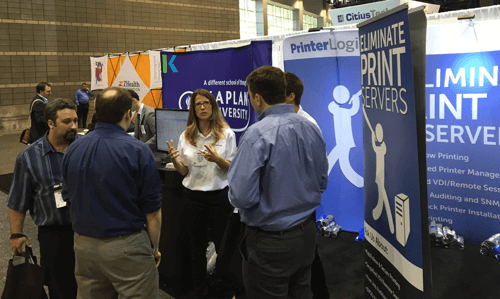 From our perspective, printing from mobile devices was top of mind with attendees. They were excited to hear about our Mobile Printing solution that allows mobile, guest and BYOD users to print from any device and release their print job to any network printer—whether they are on network or off. In addition, they wanted to better enable doctors, nurses and the staff to more easily print as they move from floor to floor. Because we centrally manage direct IP printing, IT is able to install and remove printer drivers by subnet. So if hospital personnel move from one floor to another, the drivers they need to print can be installed and removed automatically as they move from one subnet to the other. Another hot topic was with printing with Epic. Most of the customers we spoke with had to edit, delete or add printers manually on each of their Epic Print Servers. We solve this problem by centrally managing the printer environment, giving IT the ability to edit, delete or add printers from a single web-based administrator portal and automatically make changes across all Epic Print Servers, saving time and reducing human error. From coast to coast and around the world, there is nothing better than spreading the word about eliminating print servers. It was great to see our friends and customers in the healthcare industry this year at HIMSS15. We look forward to continuing the lively discussions we had. Interested in learning more about Eliminating Print Servers, centrally managing direct IP printing, empowering end-users to install their own printers with a single click or printing with Epic? Click here to set up a time to discuss your challenges with one of our engineers.